Parts of Wisconsin are back in a severe drought for the first time since the massive drought of 2012 ended earlier this spring. The US Drought Monitor says that almost all of Dunn County in western Wisconsin is in a severe drought, along with parts of nearby Eau Claire, Saint Croix, Pierce, Buffalo, Trempealeau, Jackson, and Clark counties. 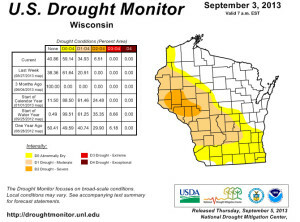 About 6.5 percent of Wisconsin’s land area is currently in a severe drought, the Monitor’s third worst category. Another 28 percent of the state is in a moderate drought. Those areas include a large portion of the west central region bounded by Burnett County, Marshfield, Columbus, Prairie du Chien, and most of the state’s western border. 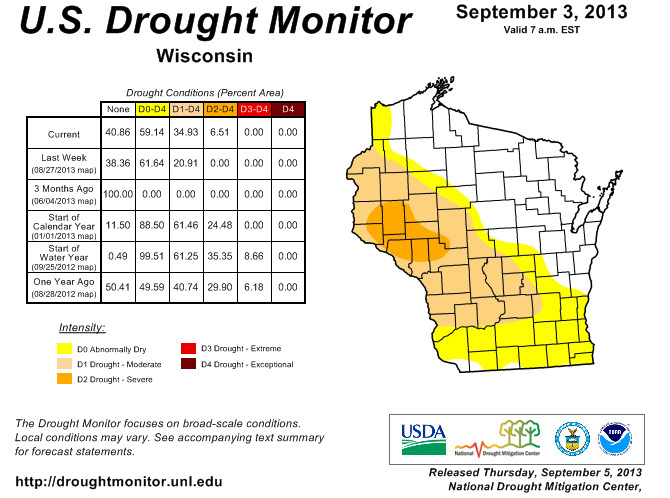 About 24 percent of the state is listed as abnormally dry, including all of southern Wisconsin and a narrow line from Sheboygan to Superior. The report lists about 41 percent of Wisconsin as drought-free. Most of the state has been plagued by a lack of rain since the start of July. It has not rained at all this week in most of Wisconsin. The National Weather Service says the next chance for rain is on Friday afternoon and that evening, and again on Saturday.